Listen to the period choral group Ensemble Organum's groundbreaking version of Gillaume Du Machaut's Notre Dame Mass. Revel as they come to rest on a sonority, time-stopping and stone-steady after so many melismas replete with microtonal inflection. This trio disc works along very similar lines, though, obviously, the mode of collective interaction is far removed from late Medieval polyphony. 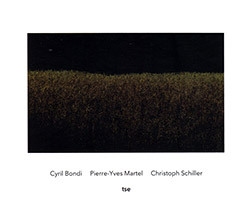 Pierre-Yves Martel, Christoph Schiller and Cyril Bondi thrive on the sonority of reflective transparency, their instruments blending and clashing to create music of stunning clarity and startling beauty. While an interview with Martel on Another Timbre's site clarifies that pitches were predetermined for several of these forms, there's no telling exactly which, and that's all to the good. As the third piece opens and proceeds along its razor-sharp trajectory astride a series of As and then Bs, it seems fairly safe to assume premeditation along that line at least; this in no way diminishes the immediate and transporting effect as Martel's viola da gamba, Schiller's spinet and Bondi's harmonium swell, pitch-beat and fade, etching points and lines of astonishing clarity in swatches of time that should but refuse to pass slowly. The introduction of some sparse percussion in the fourth piece brings new color to an already broad sonic pallet, but the best moments of the disc are those like the rapturously quiet third immediately following. It brings the music into subdued but sharp focus, re-contextualizing everything in its immediate orbit. All is washed in the complementary whine and drone of pitch-pipes played by Bondi and Martel. The same interview translates the word "Tse" as "here," and there may never have been a more appropriate album title. This is music of an ever-evolving present steeped in the past, most obviously by Martel's chosen instrument, whose unique and complex timbres relinquish their history, re-costumed in harmonium velvet and bedecked with shimmering spinet harmonics. This is music that exists outside of the time it takes to listen, timbrally fascinating or calming depending on what the listener brings to the experience.